I’m on the Barnes & Noble blog talking about my experience at summer camp in a back brace. Read more from nine middle grade authors talking about friendship, study abroad and more on Barnes & Noble. Scoliosis Campaign with Martha Hunt and CurvyGirls! Super model, role model and scoliosis warrior Martha Hunt is raising awareness about scoliosis and empowering the young women of Curvy Girls Scoliosis. 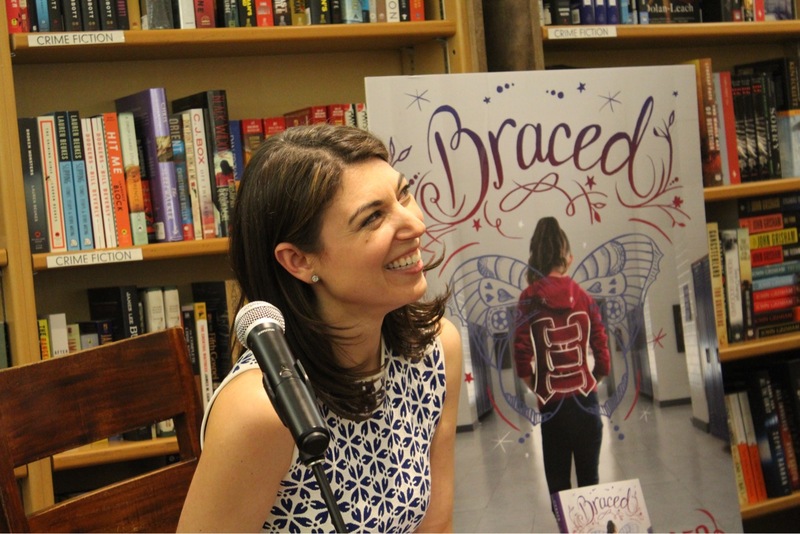 As a scoliosis warrior and the author of Braced, the first contemporary novel about this disorder, I am so proud to be part of this incredible campaign. Watch Victoria’s Secret Model Martha Hunt Takes on Scoliosis at Teen Vogue. I was eleven when the doctor said I needed to wear a back brace twenty-three hours a day to treat my scoliosis. He wanted to do everything possible to stop the S curve in my spine from getting bigger in order to prevent a spinal fusion, which my mom had undergone when she was my same age. From the moment I saw the brace and learned I’d be stuck inside a thick, plastic shell that hugged my torso from just below my bra to beneath my hips all day every day, my body and my scoliosis were always on my mind. At first, the brace made everything harder. It hurt to breathe and move and get dressed and be a kid inside my hard exterior. My brace amplified the changes that were happening to my body thanks to puberty. It pushed my chest up and out and gave me fake plastic hips that made me feel like an instant woman when all I wanted to do was blend in and be the same as my friends. It didn’t help that the way I was developing and growing required doctors and monitoring and bracing. I was told over and over that there was something really wrong with my body that needed to be fixed. During the two years and four months I spent in my brace, I kept my sadness and pain inside, hidden from my closest friends and family. 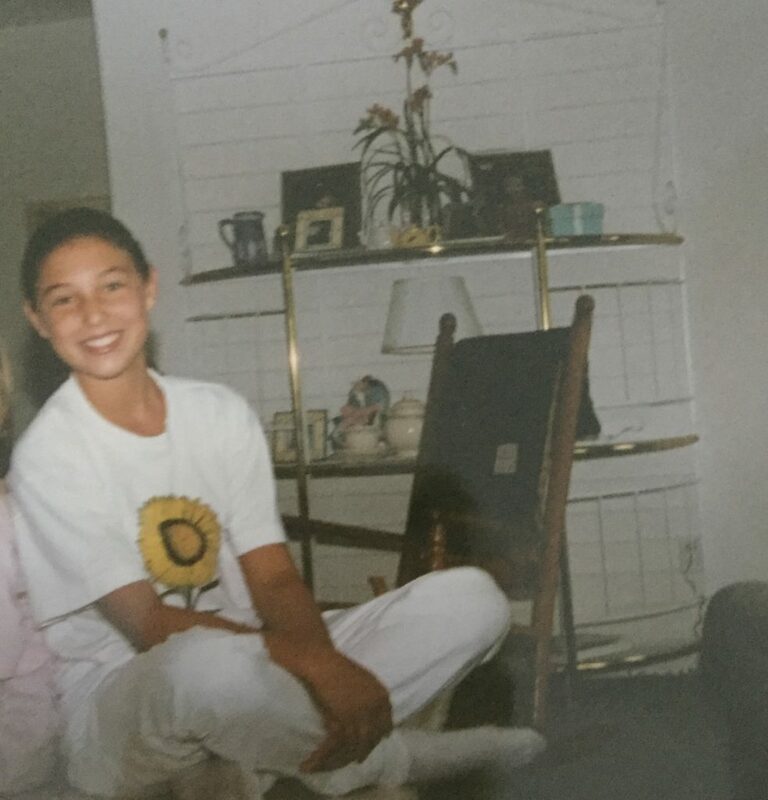 On the outside, I acted confident and totally fine with the fact that my clothes never fit right and that I had to miss out on skiing and cut back to just one ballet class a week. After two years of dancing in The Nutcracker in Boston, I had to skip that too, because the combination of performances and rehearsals required too much time out of the brace. I was heartbroken to miss out on so many of the things that made me feel good about myself. I pretended that none of it bothered me, while at the same time feeling exposed and insecure, because the last thing I wanted was for other people to see me the way I saw myself—as different. 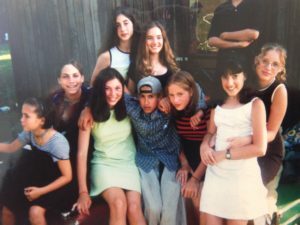 I didn’t think that being honest about how upset I felt was going to change anything for the better, and I didn’t want to keep reminding my friends that I wasn’t like them, when I was already excluded from sharing clothes and skiing and ballet. I thought talking about my brace and focusing on it too much would make it worse. After my brace came off, I didn’t want to talk or think about scoliosis. I wanted to move on. Only I couldn’t escape the negative view I had of myself. I never stopped hating my brace; it had been such a big part of who I was that I carried it with me even after it was gone, tucked away like a secret. I didn’t want anyone to see what I saw when I looked in the mirror—the S shape in my spine, the way my shoulders and hips always looked and felt uneven, how my torso was too short and seemed wrong and squished between my long arms and legs, and my stomach, which was weak from all of those hours trapped in the brace. I spent a long time after the brace came off struggling to accept my body and feel comfortable in my own skin. It wasn’t until I was in my twenties, when I started talking and writing about my experience being treated for scoliosis, that I began to realize what a big impact my brace had on my self-image. It made me feel insecure and self-conscious about the way I looked and how I fit in the world, yet I was determined to give off the façade of confidence, even around the people closest to me, because I was trying to convince myself that my brace hadn’t impacted me. More than anything else, I felt alone, because I wasn’t being honest with anyone about the distorted view I had of myself. Through the process of writing Braced, I had the opportunity to connect with a lot of people who’d experienced scoliosis, including my editor. It helped me to listen to their stories and talk openly about how scoliosis and bracing impacted the way I saw myself. I was shocked to find out that not everyone hated the brace as much as I did. There were so many different ways that people handled scoliosis treatment. Some kids I met named their braces—Mildred and Beatrice and Emily. My editor saw her brace as a protective shell, making her stronger. Through these conversations, I started to see my own experience differently. I realized there were so many positive parts about wearing a brace—things that had made me better and braver and stronger in the term and long term—that I’d never considered or thought about, because I hadn’t talked about my brace with anyone, much less people who really understood and could relate to what I’d been through. As my perspective changed, I was able to bring what I had learned from other people to Rachel’s experience and help her grow and evolve over the arc of the book I was writing. These conversations helped me to feel less alone and part of a bigger community, and I began to realize that my scoliosis is a unique part of who I am—curved spine, uneven hips, squished torso and all. It has made me a stronger, more honest and sensitive person. 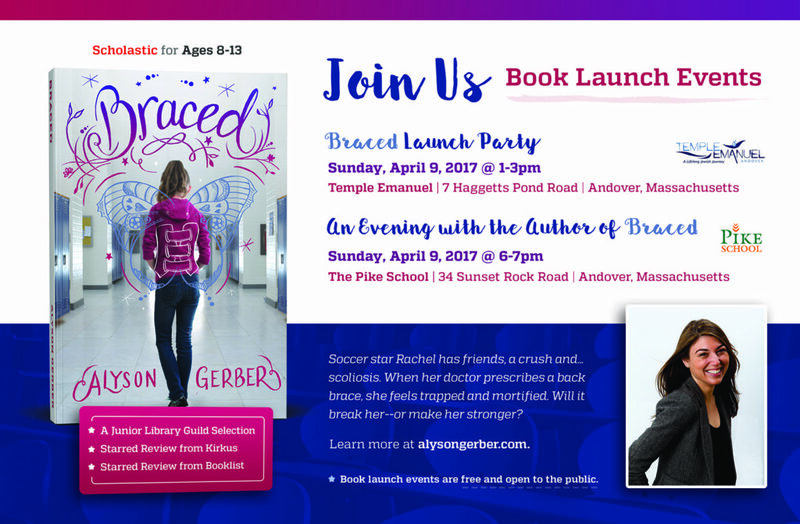 I’m so excited to celebrate the launch of BRACED in Andover, Massachusetts on Sunday, April 9! Join me from 1-3PM at Temple Emanuel for a launch party and then from 6-7PM at The Pike School for An Evening with the Author! Book launch events are free and open to the public. Big News! Scholastic Acquired Alyson Gerber’s Next Two Books! I am so thrilled to announce that my next two middle-grade novels will be published by Scholastic! Read the announcement in Publishers Weekly. Read the Rights Report in Publishers Weekly. BIG NEWS!!! BRACED received a SECOND starred review from Booklist! I love this review so much, and I’m excited to finally be able to share it. Since BRACED will be in stores in less than two months, I thought I’d share my Author’s Note, which explains why I wrote the book. Scoliosis is an abnormal curvature of the spine that affects an estimated seven million people in the United States. While girls are eight times more likely than boys to need treatment, this condition affects children of all genders, races, and social classes. Scoliosis impacts children with congenital and neuromuscular diseases, but it is most common in healthy children, where it usually has no known cause. I was one of those kids, and at eleven, I got a back brace for scoliosis. The “S” curve in my spine had progressed to twenty-five degrees, and my doctor wanted to do everything possible to avoid surgery, which my mom had undergone when she was my same age. He prescribed a Boston back brace, similar to the brace Rachel wears in this book, for twenty-three hours a day until I was done growing. It hurt to breathe and move inside my thick plastic shell, and everything was harder—standing, sitting, sleeping, getting dressed, having friends, and just being a kid. I felt confined by my new responsibility and closed off from my friends. Over time my brace became easier to manage physically, but emotionally I never adjusted. During the two years and four months I spent in a brace, I didn’t open up to anyone about how alone and insecure I felt. I held my pain inside. It took all of my strength to go to school acting like nothing had changed, while at the same time feeling uncomfortable and exposed. I used my brace as a shield, because I didn’t want anyone to see me the way I saw myself—as different. As an adult, I can see that was a mistake. I never stopped hating my brace, and it was such a big part of who I was every day that it had a negative effect on my self-image. I struggled for a long time after my brace came off to break that pattern of insecurity. It wasn’t until I was in my twenties, when I started talking about my experience of being treated for scoliosis, that I realized how alone I’d felt. Since I began working on Rachel’s story, I have met many people with scoliosis, including my editor. I’ve found that connecting with others who went through a similar experience has allowed me to feel understood and see the incredible impact wearing a brace had on my life. It has also made me aware and more sensitive to the fact that many of the people around me felt different in some way as kids. 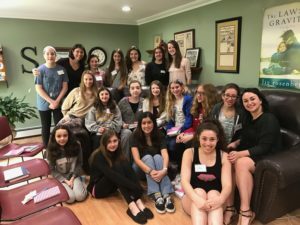 My hope is that by raising awareness about and sensitivity for kids with scoliosis, Rachel’s story might be a gateway to heightened understanding for others. I know now that had I let even one other person in on my pain, I would have felt less alone, and maybe instead of feeling different, I would have been able to see that I was strong and fearless and most of all brave. 5 of 5 Stars for BRACED from Kidliterati! Twelve-year-old Rachel Brooks learns she must wear a back brace for scoliosis as her mother did, or risk a complicated surgery, in this intimate and heartfelt story. At school, Coach Howard has just placed her forward on the team, (she’s that good) and while Rachel loves soccer more than anything, the brace now controls her life. If she misses another practice for a last-minute doctor’s appointment, she won’t make the A team. If she can maneuver like she used to, wearing the brace. Reluctant to tell BFFs at first, Frannie and Hazel, both on the soccer team, support her. Determined like no one’s business, Rachel works to strengthen her moves on the field, so she’s not cut from the team. But the kids at school are whispering and Rachel feels like a freak wearing the brace. Can she trust her friends? Rachel finds power through asking for what she wants. She finds her voice to speak out when something bothers her. This empowers Rachel. It empowers the reader. I loved Rachel’s voice her emotions are real and raw. Although I’ve never worn a back brace, this book comforted me. Who hasn’t felt like an outsider? Or felt different than others? The dynamic between Rachel and her mother, the emotion from their struggle wearing the brace, and their delicate relationship, felt very real and personal. Written from the author’s experience of scoliosis, she takes us on a journey with Rachel, who must face a new normal. A place where not giving up, and speaking out when something bothers you, rule. Read the review of BRACED on Kidliterati. 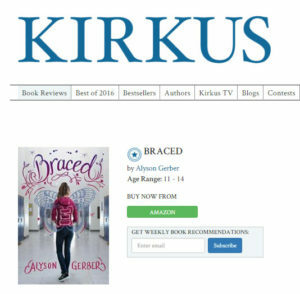 BRACED has received a starred review from Kirkus Reviews! “Both the literal and figurative senses of the word “spine” form the backbone of Gerber’s debut. The same day white seventh-grader Rachel Brooks starts in an important soccer game, she learns that her scoliosis has worsened, and she now needs to wear a brace for 23 hours a day. The author, who wore a brace herself, vividly conveys its constricting bulk. But her spine isn’t the only curve Rachel has to brace herself for. Her mother, whose own scoliosis required a spinal fusion, is rigid and unsympathetic as the brace affects Rachel’s soccer technique and jeopardizes her place on the team. Her classmates gossip, and though her friends and crush are generally supportive, the author nails their realistic discomfort at being bullied by association. Ultimately, her friends help her to adjust, and Rachel learns to assert herself. As Rachel grows a spine, her mother learns to bend, sympathetically revealing the fears she never addressed during her own treatment. Their disparate experiences give scoliosis—and their relationship—nuance as well as tension. The author doesn’t diminish Rachel’s difficulties, but at heart her story is uplifting; a brace can be a “built-in drum” to dance to. 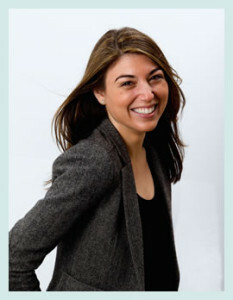 An author’s note provides a short list of scoliosis resources. 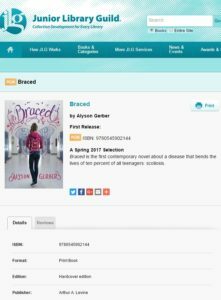 I am so excited and honored to announce that BRACED is a Junior Library Guild selection for Spring 2017! 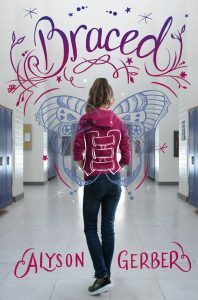 Braced is the first contemporary novel about a disease that bends the lives of ten percent of all teenagers: scoliosis.